Spoilers for The Flash and Arrow. Trigger warning: This episode deals with violent and dark themes. In the previous episode, Barry regained his speed force abilities, and Zoom formed an army of meta-humans from Earth-2. Now Barry and the STAR Labs crew must find a way to stop the meta-humans from destroying Central City. Iris: "Some people are calling it the metapocalypse, the days when Central City was overrun by an army with powers beyond imagination. But in these dark times, we must never forget our own strength, our own power to fight back. That it is only in the blackest of nights that we can truly see the light... and know for sure we are not alone. We are never ever alone." Central City is on fire. Meta-humans run rampant through the city, attacking police, civilians, and buildings with their abilities. The police are overwhelmed and can't hold out much longer, surrounded by angry metas, when the Flash arrives to save them. (Huzzah!) But this is only one section of the city. Cisco and Iris are worried that Barry's confidence is a little over-the-top. They don't understand what happened during his time in the Speed Force, but they can't quite believe what he's been saying. They think he might be setting himself up for failure. At Mercury Labs, Dr. McGee goes over groundbreaking work when a meta with a crazy cry ability attacks. The building shakes, and windows shatter. Barry and Cisco watch over Caitlin as she sleeps. Cisco tries to talk to Barry about the whole Speed Force thing. Then, Cisco vibes and sees a dead bird on the sidewalk. They get an alert about the attack on Mercury Labs, so Barry suits up. He races over and rescues Dr. McGee and the other scientists from the building just before it collapses. The meta--who looks like Laurel Lance--walks away from the debris with a smirk. Caitlin is giving Jesse a check-up when Harry walks in. Jesse thinks the dark matter might have affected her, but Harry tells her she's not a meta-human. Instead, she is a young lady with genius-level I.Q. that can help them stop the meta-humans taking over the city. Caitlin hallucinates seeing Zoom, which shakes her up. Barry brings back the camera from Mercury Labs to find out who destroyed the building. (Though, they never get back to this plot point in the episode?) Henry pulls Barry aside to talk to him about the Speed Force. Barry says he's not afraid anymore, but Henry tells him to still be careful. Barry takes it the wrong way and lashes out. Another alert goes off--this time it's the CCPD, where Zoom is. Barry races off to find Zoom before anybody can stop him. Barry: "What I was shown in the Speed Force, it didn't just change my mind, it changed me. I don't know--what you're seeing as optimism is, for the first time, I'm just not being afraid anymore." Zoom is in Barry's forensic lab, looking over the investigation board about Nora Allen's death. Barry comes in, which reveals to Zoom that he has his speed force abilities back. Zoom says he knows Barry, knows what's holding him back. He says they're the same. They have the same tragic childhood, the same anger. Just as Barry lunges for Jay, a building next door starts to crumble. Zoom says he can beat Barry because Barry always has to be a hero. He has to save the day. Barry returns to STAR Labs and says they need to stop Zoom but in order to do that they need to take out all of the metas at one time. They have to work together. On Earth-2, the metas worked on a different frequency than this earth. Barry speculates about creating a frequency to mess them up. While Team Flash gets to work, Joe talks to Barry about Wally. He asks Barry to talk to Wally again--as the Flash. Cisco vibes again, and he sees more birds flying into a building and dropping to the ground, dead. Cisco: "Birds! Why? It's like a Hitchcock movie in my head." She screams at him, which knocks Barry over. They fight, but Barry can't focus because of the ringing in his ears. Black Siren says Zoom might actually be afraid of the Flash, yet she finds it easy to destroy him. Then Wally rams his car into her. He offers the Flash a ride, and Barry gets in. They drive away. Black Siren returns to the CCPD to talk to Zoom. (I love this. Katie Cassidy is fantastic.) Zoom admits she's good, but he says she's not good enough. He tells her to go back out into the city and knock down more buildings. She questions why she should. Zoom tells her it's a distraction for the Flash and his team--so they won't know what he's doing. Cisco practices his new device on Harry, which appears to work. With Hartley's help, they figure out a way to send a pulse into Central City to amplify the higher frequency and knock out the meta-humans and Zoom. They make special headphones for Harry and Jesse to wear. They get an alert about another attack on a building. They want Barry to start the amplifier, but Barry wants to save the building. He can'd do both, so Cisco comes up with another idea. At STAR Labs, Harry rambles on about Cisco's device and what it will do while everybody else stands by and listens, baffled. Barry leaves to create the barrier around the city, which will amplify the pulse. Harry releases the pulse. Meta-humans around Central City start to scream and collapse, including Black Siren and Zoom... and Jesse. Her headphones don't work, so Harry takes his off and puts them on Jesse, exposing himself to the higher frequency. Zoom creates a portal and races through before he can collapse. Harry falls to the ground. They turn off the pulse. The Flash collects the unconscious meta-humans and locks them up. (Apparently, they aren't dead. So the whole headphones thing with Harry was very anti-climatic.) Barry and Cisco talk to Caitlin again. She says helping them made her start to feel normal again. They hug. (I love these three. Original Team Flash for the win!) The Flash tells Joe and the police captain that Zoom escaped to Earth-2. Barry talks to Joe about Wally. He says he won't talk to him again about stopping because Wally has started off on a path that is exactly what Joe is doing--being a hero. He grabs Henry and tells Barry their story isn't over yet. He zooms away. Barry races after him, revealing himself to Wally, and chases Zoom across the city to his childhood house. Zoom holds Henry in a death grip. Barry offers his life for Henry's, but Zoom says if Barry can't see that they are the same, Zoom will make him see it. (Oh, look, Zoom looks conflicted again. Hmmm...) Henry tells Barry that he has made him the happiest father. (No. NO. NO.) Zoom says Barry will become just like him when he watches his parent die right in front of him, just like Zoom. Then, Zoom thrusts his hand through Henry's chest. (Hey there, Kylo Ren, I see you've returned.) Barry screams. 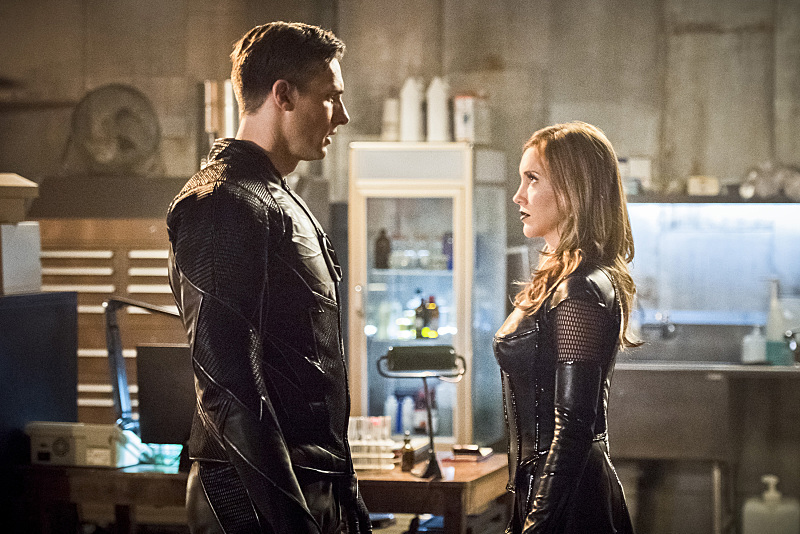 This episode was very exciting between the appearance of Earth-2 Laurel Lance (!!! ), Wally's extracurricular activities, Caitlin's trauma, and Cisco's vibes. I thoroughly enjoyed this episode. The meta-apocalypse thing felt a little underdeveloped. I mean, it made sense, but once they dealt with all the metas and locked them up, the city just went back to normal. No trauma to deal with, no rebuilding, everything is just perfectly fine. It felt a little anti-climatic. It was great to see Katie Cassidy pull off another role. Black Siren was especially fun. (I just want to know why all the meta-humans on Earth-2 are evil. Is it because they're mirrors? Earth-2 Barry wasn't evil.) I like the direction Wally's character development is going. While I was hoping he and/or Jesse would become speedsters (and maybe fall in love), it looks like they haven't done that quite yet. (Maybe the season finale will lead to it?) However, Wally has still started off on his journey to becoming a hero. I felt so bad for Caitlin this episode. She is showing a lot of strength after everything she's been through. I'm so glad she has people like Barry, Cisco, and even Harry to encourage and comfort her. It was really nice to see the original Team Flash gang come together to help her out. Cisco's vibes were interesting! Of course, it's the end of the world. How could it not be for the season finale? I'm definitely excited to see how the season ends and all these loose threads tie together. How will they stop Zoom? How will they save Earth-2? Who is the man in the Iron Mask? What will Barry do in reaction to Henry's death? What will happen with Wally and Jesse? There's so much potential revved up for tonight's season finale! What did you think of "Invincible?" What do you hope happens in the season finale?